I am really interested in the Canada Through a Lens: the British Library Colonial Copyright Collection, for which a “hotchpotch of imperial muddling, colonial making-do and individual protectionism developed a collection of photographs that covers the length and breadth of Canada.” It is interesting in of itself but even more so as a product of the happenstance of bureaucracy (having to do with copyright). I wonder, in light of this week’s readings, what the limits are of viewing the somewhat arbitrary as generative of new connections. This is of course, not an entirely random collection. It has been curated and covers a particular place for a particular span of time; yet its subject matter is seemingly delimited most by what was of interest to photographers of the time rather than a central question, style, or event a collector desired to cover. As such, it has the effect of presenting a view of the preoccupations of the day, from the mundane but perhaps aesthetically pleasing or comfortingly familiar to the potential to build narratives (like the men above struggling to ride into the twentieth century) or capture strange occurrences. It is, as I suspect Daniel is suggesting, perhaps a bit naive to assume that free wandering is possible and always desirable. All the same, I find collections such as this that come together through a variety of circumstances more so than out of an active search, have the benefit of raising more questions (because they are not themselves the answer to one in the same sense). I didn’t have the opportunity to get through all of it, but I think it would be quite interesting to look at such a collection in conversation with Daston’s Wonders and the Order of Nature. Daston states that wonder once existed (and does so again) on the margins of the natural. I think that in a very plain sense we see that here. A train is not so wondrous as a train derailed; a bear or a man of less interest when not embracing. They are captured just on the edge of their natural state. Yet there is so much of the mundane in this collection as well. Is this an echo of the golden period Daston is tracing, before the Enlightenment shunned the act of wonder form scientific inquiry, when the wondrous was for a moment a central concern? True their status as art objects may bespeak their marginality, fitting the notion that they do not belong properly to the categories of the sciences of greatest interest to Daston. Even so, her ways of thinking about where the wondrous fits in is compelling when facing any collection. Is wonder what propels the collection or what I bring to it? Do these photos I am calling mundane take on appeal only as the scenes they depict become antiquated? Is it possible we find wonder in the everyday only in the context in which we become hyper-saturated with the fantastic and, as in more modern photography and film, impossible? I am taking Grafton two ways. One is that he is, useful to our purposes, telling a story about a network which we then see on the mapping the republic of letters website. The other is that he is telling a story about knowledge acquisition and cooperation relevant to scholarly exploration, visualized or no. As Nicole pointed out, Grafton stresses the general knowledge of a single scholar. While stressing the breadth of the individual, however, he is also revealing the ways in which such wide knowledge depended upon a system of connections. We seem much more enabled to make such connections now and I think that by and large people take advantage of this ability, though perhaps not with the same sense of urgency that the difficulty it posed in Locke’s and Voltaire’s time might have inspired. All of which is just to say I find it useful to think on this model both as network data and as a reflection on the use and function of networks. One thing that strikes me as particularly important, then, is that it would seem much of this correspondence had a specific intended audience and was in response to particular questions risen in the back and forth. Perhaps that is an idealistic view to imagine the republic of letters was fueled by genuine curiosity more than vanity or networking for networkings sake, but true or no it points to the ways in which the intention and nature of the exchange seem as important as the means and content. e.e. spammings, filtering spam to create poems in the style of e.e. cummings. The second is very clearly a move from useless data to art. What of the first? Can useful data be art or does it, should it, always serve a purpose? I know, I am going down a rabbit hole by suggesting art is art because of its lack of utility. I don’t really want to open up a ‘what is art’ debate, but I am very curious about what sets the boundaries of a visualization project in the digital humanities. The biggest puzzle for me coming out of this week’s reading lies somewhere between Bodenhamer’s epistemological concerns and Monmonier’s many representations of the same data. 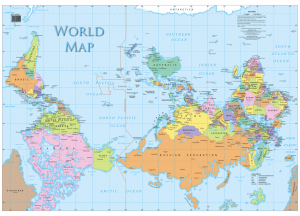 The first is a map of the world “upside down.” My primary reaction to this map is how well it illustrates the primacy afforded to North or ‘up,’ at least in Western culture. Look how superior Australia looks! What I don’t realize when I look at that map is the extent to which I appreciate the altered perspective, but still more or less consider it to be a distortion of physical reality. 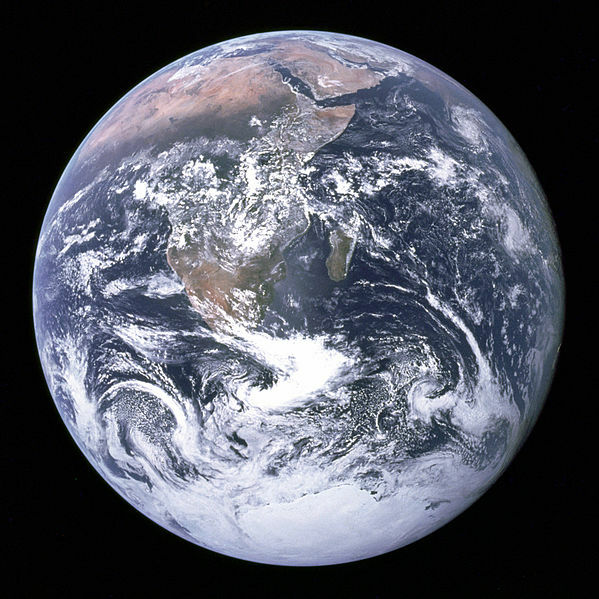 For that I need these next two photos, taken from Apollo 17 as it orbited Earth in 1972. The first is the actual photo as it was taken. 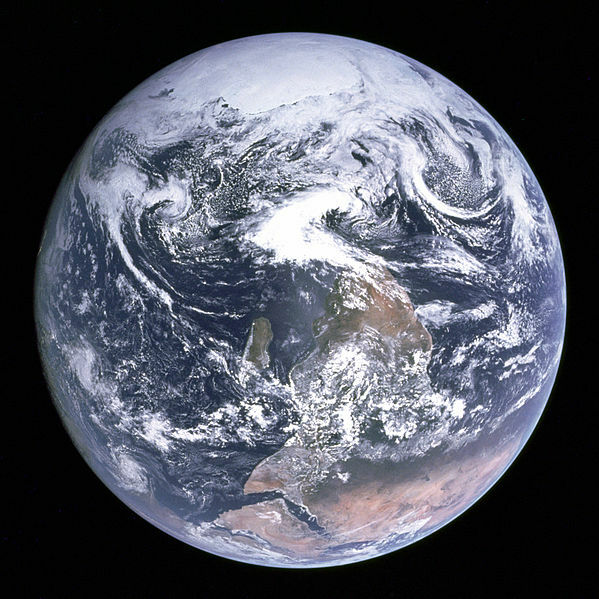 The one beneath is the photo as it was made public (known as the “Blue Marble”); it has been flipped. This may be a slightly embarrassing thing to admit, but it actually takes me a minute to understand how it is possible to take an upright photo with the South Pole on top. The extent to which this spinning object with no real point of reference in the universe exists in my imagination as having an actual ‘up’ side is a fairly hard idea to break. I bring up these examples because I think they illustrate the problem with how all things in mapping are relative–literally, in the sense that space is only measured by relationships, but everything about how that relationship is oriented is subject to interpretation. I think this raises difficulties but also really interesting possibilities for mapping. Monmonier creates several maps, number line plots, and scale labels for the same data. The differences are rather dramatic. His most prominent example in the statistical data chapter has to do with infant mortality in New Jersey. He is trying to figure out how to represent Essex county, where the majority of deaths occur, but which is also heavily populated. The many versions create really disparate perceptions of how focused in Essex county the problem is. It seems fair to modify the visualization of the data to something closer to a per capita representation: without it, it seems like there is a unique problem in that county that other counties do not have; with it, you can’t see as well the concentration of total deaths and may have a skewed view of the actual numbers. And this seems a far more straight forward mapping project than a lot of others. The question I am getting to is one of process: How does one ascertain the scale and the set up that best demonstrates a desired narrative, without warping the data too far to support that narrative? To what extent is our freedom to reconfigure these relationships limited to the graphicacy of our audience–their ability to recognize the world as the world from a unique but no less true point of reference? Reading for this week, I was reminded of an op-ed in The New York Times that came out at least a couple of years ago. Like a lot of op-eds in this paper, it was about declining higher education: wherefore and what to do (I cannot find it anywhere, but swear to its existence). This particular article was about breaking down silo modeled departments in favor of topic oriented majors. The example it used was water. A student could learn about water crises historically and anthropologically, use poli-sci to get into the politics of fresh water distribution, and of course learn the science of water treatment, geology and geography of watershed, you get the idea. It is intriguing and, I think, not unlike the siloed model it seeks to replace, problematic. The question of how to divide areas of inquiry (in or out of academia) is interesting to consider alongside Steve’s article on, among other things, the implications of causality in the construction of chronologies. Taxonomies, like timelines, come with assumptions, and any delineation means a potential leaving off or flattening. I wonder what work they do together. We of course already consider the what and not simply the when in constructing a timeline, but I think it is useful, if also a bit daunting, to consider how the boundaries of the subject matter have been demarcated. Which is to say, the subject matter and also the frame around that subject matter that makes it seem to all fairly naturally belong. The issue I have with the water idea is that is geared to ‘solve the world’s problems,’ which seems increasingly to mean that historically contingent situations with real human actors can be reduced to a language of engineering and that all challenges are equally design challenges. Could a timeline help? Could it take the pinpoint of an issue and extend it back to a more complex understanding? Can interdisciplinary questions create, if not better, than at least, diverse chronologies? Of course timelines are by their nature history, but which histories bear relevance to one another seems to still be a fairly open field. Some of the suggestions in the reading highlight the ways in which the digital could be especially useful in thinking through these questions. The first chapter of Digital_Humanities brought up a question that has been nagging at me for a while: How do you make the learning (be it archives, lectures, dissertations) that takes place in a university available to a wider audience with whom the exchange is potentially mutually beneficial without hurting the people at the bottom of academia–those who, under current models, still need claims to authorship and who teach 30, much less a 1000, students with little compensation? I am, frankly, less concerned with how this works at private schools like Brown than how it affects schools like CUNY, where I studied, worked, taught before coming here. There, the answer to how to address the long waning commitment to funding for public higher education seems to be that you make it cheaper to produce via adjuncts and MOOCs. While this situation may be too specific to my own interest to be useful for class discussion, I do think it points to the larger charge of DH at the heart of this chapter: that a major part of doing DH is negotiating with and hopefully shaping the dominant culture of universities. MOOCs are largely not a DH thing, I know. But MOOC proponents do seem to employ the rhetoric of DH to advocate on their behalf. This total non-coincidence raises important questions. I don’t think practitioners of the digital humanities can or should police all things digital on their campuses, but I don’t think that technological interventions into classrooms could be said to fall outside their area of concern either (regardless of where one stands on it). I really appreciate how these authors propose bringing “the critical insights, creative designs, speculative imagination, and methods of comparative, historically informed study” (24) of the humanities to the business models of knowledge-making found in universities, particularly alongside their insistence that “the generative humanities are emphatically not about training for a market” (25). At the same time, I find these assurances a bit at odds with the emphasis on “making things” (10) and the promise that digital methods will make the humanities marketable once more. My question then, I suppose, is how to keep the optimism about effecting change in educational models without, along the way, fueling the naive or even a little exploitative and counter productive. Latour’s thoughts on inscription and mobilization as the driving considerations of visualizing, dispensing, aggregating scientific thought are framed within a decidedly Foucauldian concept of power. This is evidenced by his treatment of Foucault, of course, but maybe even more so in the conclusion that “the role of the bureaucrat qua scientist qua writer and reader is always misunderstood because we take for granted that there exist, somewhere in society, macro-actors that naturally dominate the scene” (28). These “summed up” givens of science ought, Latour argues, to be the subject of our attention to data rather than the dominant theories that delimit its field. This reminded me of the WEIRD acronym I have encountered recently (Western Educated Industrially Rich Democracies). The distinction this category seeks to make is between globally, pluralistically dominant tendencies in thought and perception and the more cited, publicized, and accepted results of tests done on subjects living in WEIRD places. This article, for example, discusses the theory that it is via a disproportionate exposure to right angles that WEIRD people are fooled by an optical illusion which, by and large, fails to stump people in other parts of the world. While I don’t really know enough about psychology or these studies to argue the WEIRD theories, I do think they illustrate some of what is really exciting, interesting, problematic about what Latour asks us to do. Considering the possibility that vision itself (as in the perception of color) and certainly one’s investment and approach to visual information is culturally determined, raises obvious to see, but difficult to deal with, questions about how we can interrogate the assumptions we make when we represent something visually, to what extent we can make a work pivot on different sets of assumptions and to what end we can reasonably expect to control any of it. I opened with Foucault (I promise to never do it again) because this process seems a lot like reading him and having to try really hard to not lapse into a sort nihilism –nothing is outside the problem and therefore all things are equally a part of it– that is neither especially true nor even a little bit helpful. All the same, I think it is worth discussing even the really really big, Western Civ size assumptions of a project if only to make as many informed, conscious decisions about it as possible.